Over the last 18 months we have faced a roller coaster of challenges, triumphs, setbacks, heartache, and pain. Through it all, I have learned that I can choose to wallow in self pity, drown the sadness in brandy, or I can choose to make a DECISION to start truly living again, to pull myself up by the bootstraps and find my own happiness, somewhere deep in that open field within my soul. I choose to start living again. Now it is a matter of going through the steps that will make it possible. 2. Get out of the apartment (and away from the computer) every single day, even if I just go for a 30 minute walk or swim in the early morning light, or spend time browsing through Borders. It may even be time to start another 30 day photo journey. 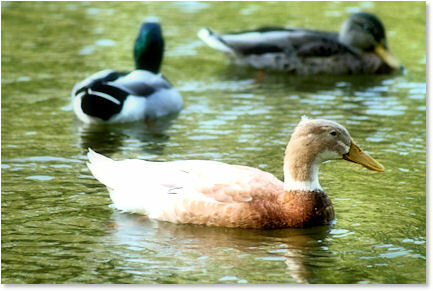 It’s pretty tough to feel anything but joy while photographing ducks playing and bathing in the pond. 3. Get back in the gym again. One of the things I have missed most from Mississippi is my daily workouts at the gym and evening walks at the track. It always gave me time to work through the thoughts in my head, and just plain made me feel better. Tomorrow morning I will be going with my son to join the local gym (Spectrum) here. Okay, I know it isn’t enough to join. Turns out it only works if ya actually go and do something beyond sitting in the lounge drinking coffee and watching the old guys sweat. So yeah, it time to put myself back on a daily workout schedule. Does this mean I get to go through the sore muscles all over again? Waahooo, Cricket is back. I enjoyed the last photo journey so much I do hope you will do another one. The early morning walks are great. Jim and I walk most mornings. We live on a steep hill, walk down to the bottom (our warm up) then all the way to the top. The view is always different depending on the weather. In the Fall, the leaves ae beginning to change colors and the smells are of the fall leaves. The Spring brings fresh green and spring flowers. Somehow the gym does not appeal to me at all. Welcome back, girl. Missed ya. You are back, and I am glad! I thought of you often. I’m so glad you’re back!!!! You would have left a whole the size of Texas in many hearts and lives.